I had a nice time at fencing tonight. Instead of fencing, it turned into movie night. When I got there they were watching a vampire movie. It was pretty fun. Then the next movie was one of my favorite creepy movies, Carnival of Souls. I hadn't seen it for years. The New York Times TV section used to run one or two sentence descriptions of movies. 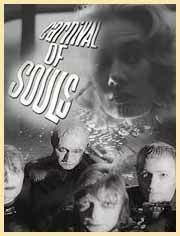 The title of this post is what they wrote for Carnival of Souls. It was fun to see the movie again. I had never noticed the ongoing thread about the main character's lack of religion. I didn't learn to spot that stuff until I went to college, and the last time I saw Carnival of Souls was long before that. Speaking of car trouble, I ran across a video put out by the ACLU that tells how to interact with the police if they want to search you, your car or your house. It's long, but entertaining enough that you don't get bored. I recommend watching it. We all need to refuse to allow unjustified searches. This video offers some helpful hints on how to Just Say No to police violations of your Constitutional rights. Watch and learn. I wish you lived close enough so you could come to my friend Jamie's movie nights. He's got hundreds (if not thousands!) of horror movies, old and new. The ACLU film is great; should be required watching. I loved those Times things. You have a great memory. Great video! I just put the link on facebook. And I'm gonna re-up my aclu membership. Highly amusing and very educational! "Am I free to go now"?